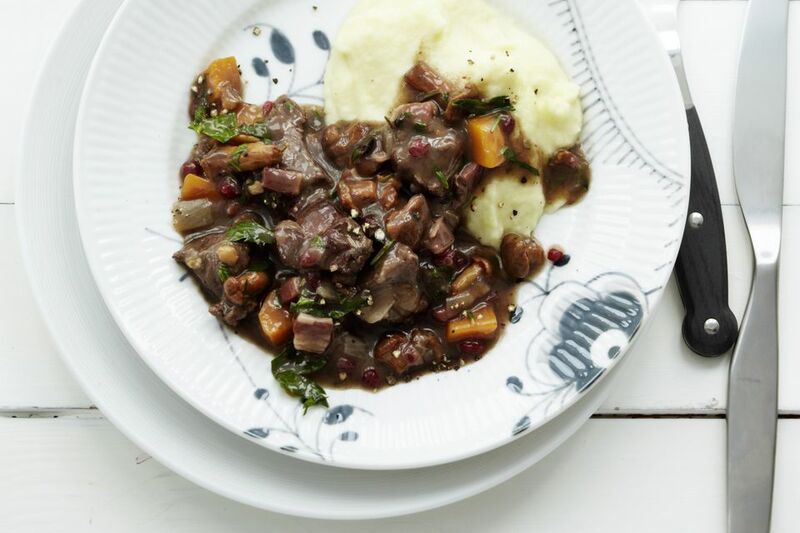 The key to this venison stew is that it's cooked slowly. It can be made in the oven or in the slow cooker. The simple combination of seared venison, mushrooms, soups, and seasonings is an easy preparation. Feel free to add some vegetables or use different soups in the recipe. Serve this venison stew over hot cooked rice or egg noodles or serve it with mashed potatoes. Any leftover stew can be stored in a sealed container in the refrigerator for 4 to 5 days. If you have a lot of leftovers, store the leftover stew in a sealed container in the freezer for up to 6 months. To defrost it, simply leave in the refrigerator overnight. Heat it in a saucepan and dinner is ready! Trim the venison roast and cut it into 1 inch cubes. Sprinkle the venison cubes with seasoned salt and pepper. Roll the pieces in flour to coat. If you have a slow cooker with a saute feature, heat 2 tablespoons of olive oil in the slow cooker and sear the venison on all sides. Then remove and sautee the mushrooms. If not, heat 2 tablespoons of oil in a skillet over high heat; sear venison pieces on all sides. Place the venison in the slow cooker. If using fresh mushrooms, add a little more oil or butter to the skillet and saute the mushrooms, stirring, for about 4 to 5 minutes. In a bowl, combine the soups with the sauteed or canned drained mushrooms; stir to blend. Season with garlic powder, onion powder, and Worcestershire sauce. Pour the mixture over the venison in the slow cooker. Cover and cook on the low setting for 9 to 11 hours or on the high setting for about 4 1/2 to 5 1/2 hours or until the venison is tender. Sear the seasoned and coated venison cubes in the skillet and transfer to a Dutch oven or casserole. Saute the fresh mushrooms, if using. Combine the soups and the sauteed or canned drained mushrooms with the garlic powder, onion powder, and Worcestershire sauce. Pour over the venison. Cover the Dutch oven or casserole and bake for 3 to 4 hours, or until the venison is quite tender. If you can't find beef noodle soup, substitute with French onion soup, a vegetable beef soup, or chicken noodle soup. Add diced carrots and/or celery to the pot or casserole with the venison cubes. Add diced rutabaga to the pot or casserole along with the venison. Slice a large onion. After the venison has been seared, add the onion and an extra tablespoon of oil to the skillet. Cook the onion over medium heat, stirring frequently until it is lightly browned, about 7 to 10 minutes. Add the browned onion to the venison and continue with the recipe.